Just in case you are thinking of offering SEO and digital marketing, I wanted to make a quick list of the resources and tools you’ll need to be successful. A professional digital marketing company or consultant will have access to, or own most of the following. Some of these are simple resources, like time, and some are web properties like social media accounts and web sites. A decent and active facebook page. To Share your content and engage others. A decent authority and active Twitter page to share your content, engage and build relationships. A decent authority and active Google Plus page. Same as above – share and engage. If you are a local company, you will need to be listed and verified in the major local directories. Starting with Google + for business, but only after you have submitted your exact and correct information the main national “source” directories. An understanding of how the Local Directory systems work is essential. Relationships with Social media firms. Time or money to research online opportunities. Time or dollars, to engage others online through blogs, Social sites, forums, and email. A private network of authority white hat sites is very valuable. A working understanding of white hat SEO and linking practices for off site work. Accounts with one of the major SEO software providers. Moz, Majestic or a handful of others. A passion and willingness to write great content, or the ability to hire someone who can write great content. Why all of these? Well, today SEO is still about links and mentions just like it always has been. The difference is what we call a link or mention, and how we earn them. Note the word earn. SEO Is Just Good Old Fashion P.R. Because most of the easy and cheap tactics to get a site highly ranked are long gone. Today you have to earn them through good content development. intelligent and valuable engagement on social sites and forums and any where. Although old fashion link building still is utilized (and in some cases effective) the long term process of “SEO” is now much closer related to the old fashion P.R. world. In that world, you create an event, that would draw attention from your market through the news media. Today, you create content that will draw attention through the Internet, and the “authority” or at least popular sites your market will visit. Same stuff.. different media. What you want on your site is fresh and good content. Site owners that just swap information from other sites or Blogs don’t do much to bring up the bar (so to speak) for good content. Fresh, original and new…. those are great marketing concepts, and very good for S.E.O. as well. 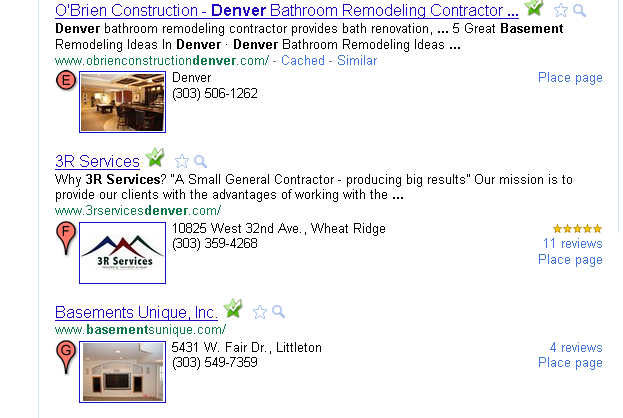 Local SEO should be more than getting your site ranked well on search engines. You need to also think what your web site ranking will look like! Given the choice of being first for a category with no reviews, or third with 10 great reviews I would go with the third spot, and the reviews. Which one would you look at? Reviews bring positive attention, and will more than likely bring more clicks to your web site. 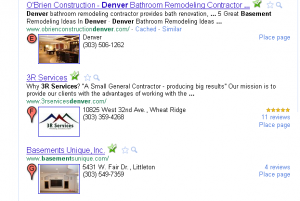 There are several other factors that will affect how Google displays your web site. You need to manage all of those to get the right people to your site.